No, I’m not checking to make sure that each leaf, stalk, and fruit is free of pests before it gets tossed on the growing pile, as is suggested by some people. Look closely enough, and you’d find that just about everything would have some hostile organism on it. Given sufficient time and heat, a well-fed compost pile should take care of such potential problems. Joseph Jenkins, in his excellent (and fun-to-read) book, The Humanure Handbook, quotes research showing complete human pathogen destruction in composts that reach 145°F for one hour, 122°F for one day, or 109° F for one week. The same should be true for plant pathogens and pests. For decades, I’ve tossed everything and anything into my compost piles and never noticed any carry over of pest or disease problems. Heat and temperature can also do in weed seeds. Survival depends on the kind of weed: Research shows that a couple of weeks at 114°F kills pigweed seeds while only about a week at that temperature killed nightshade seeds. Generally, though, temperatures of 131°F for a couple of weeks kills most weed seeds. Heat and time aren’t the only threats faced by pathogens, pests, and weed seeds in the innards of my compost piles. In addition to heat, various antagonistic organisms — including friendly (to us) bacteria, fungi, and nematodes — stand ready to gobble them up. Speaking of weeds, they also become compost food. What sweet revenge it is to toss a mugwort, creeping Charlie, and woodsorrel onto a growing compost pile and then get them back as dark, rich compost. Other organic materials that go into the compost piles are a mix of goldenrod, bee balm, grasses, yarrow, and whatever else is growing in my south field. I cut it with a scythe, let it wilt for a day, then gather it up. Also some horse manure, which I like mostly for the wood shavings that provide bedding for the horses. The manure itself furnishes nitrogen, which compost pets need for a balanced diet — 20 parts carbon to 1 part nitrogen but no need to be overly exacting because it all balances out in the finished compost. Lacking manure, soybean meal is another nitrogen-rich feed, as are grass clippings and kitchen waste. Feeding a variety of compost foods provides a smorgasbord of macro- and micronutrients to the composting organisms and, hence, to my plants. Every few inches I also sprinkle on some soil, to help absorb nutrients and odors, and some ground limestone, to lower acidity of our naturally increasingly acidic soils, and to improve the texture of the finished compost. Compost made this year gets used next year, mostly around now. It was too late to plant a late vegetable crop in the bed I just cleared of old corn stalks, so I’m blanketing that bed beneath an inch deep in compost. The same goes for a bed in which grew an early planting of zucchini. Actually, any beds that get cleared before the end of this month will get, before I lay on that blanket of compost, a dense sprinkling of oat seeds. The seeds will germinate and the seedlings will thrive in the cool weather of autumn and early winter. This “cover crop,” as it is called, protects the soil surface from pounding rain and insulates the lower layers. The oat roots latch onto nutrients that might otherwise wash down through the soil. And as the roots grow, they nudge soil particles this way and that, giving the ground a nice, crumbly structure that garden plants like so well. Beds cleared after October 1st get only compost, which is almost as good. In all honesty, I’ve never noted any difference in the soil or vegetable plant growth from using compost alone as opposed to compost plus a cover crop. 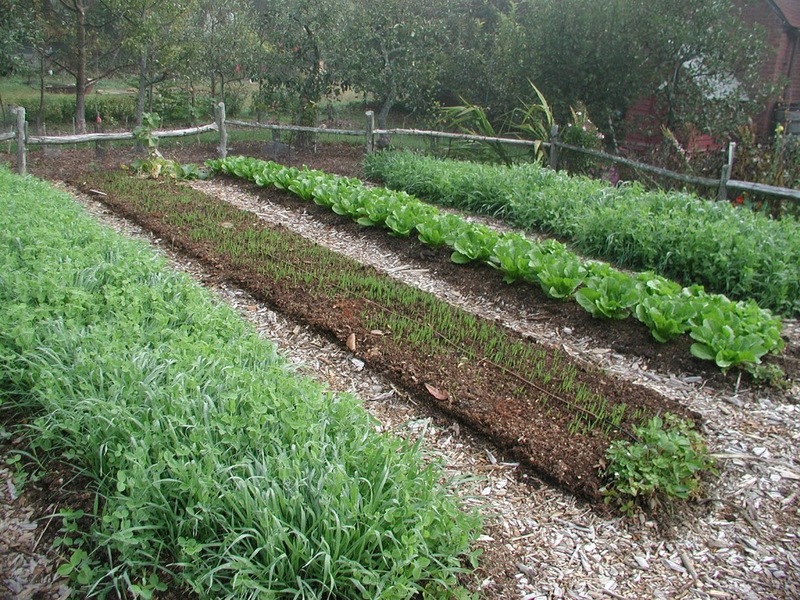 The abundance of compost, in either case, might trump the effect of the cover crop. The green cover does look nice going into winter. Turnips and winter radishes planted 6 weeks ago are growing well and need thinning so that each plant has space to swell up its fat, tasty root. While turning my compost pile recently, I found about fifty grubs and squishsed them. Do you think they would have survived in the heap if I had left them alone?